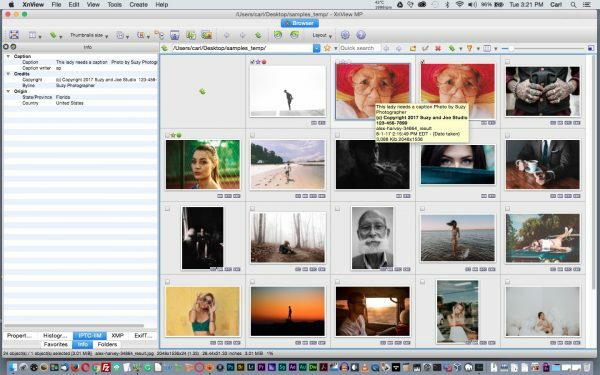 XnView is a powerful photo browser, metadata editor, and batch conversion tool. It’s not hyperbole to call it “the poor man’s Photo Mechanic.” Here, the Properties pane pops up over the Viewer. 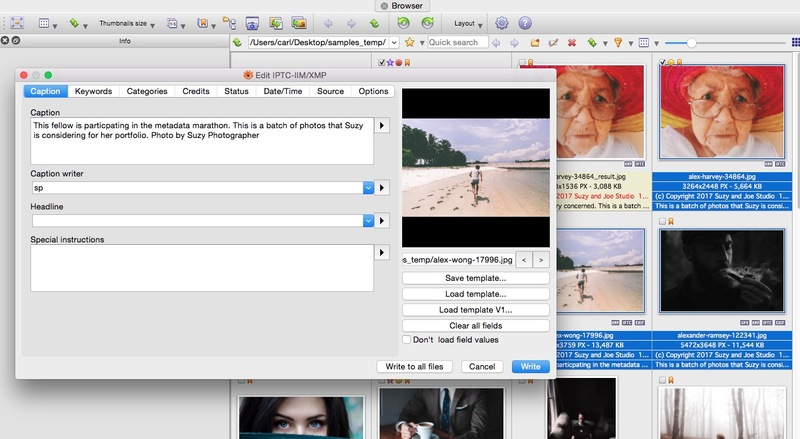 XnView is a photo browsing/editing/metadata tool. It operates in a files and folders environment, like Photo Mechanic, and unlike Adobe Lightroom. It’s available at a price that suggests that there’s no reason not to have a good tool for working with metadata. You might consider it a poor man’s Photo Mechanic. For companies, XnView costs € 26. For individuals, it’s FREE! 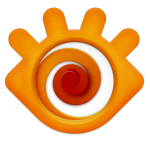 XnView is available for Mac, Windows, and Linux systems. Photo Mechanic notwithstanding, I have long recommended that every photographer and photo editor have XnView in their toolkit because it can open so many file types – over 500, according to the XnView website. It’s pretty good at opening corrupted files or files that have the wrong filename extension. And for anyone who prepares photos for use on the web but doesn’t need to edit thousand-frame takes, and, let’s face it, just isn’t going to shell out a hundred and fifty bucks for Photo Mechanic and hundreds more for Photoshop, it’s a top choice. If you work on Linux, XnView is the runaway best choice (darn near the only choice) for pro level photo selection and metadata operations. All that said, in XnView, you won’t find the stability or the finely-honed user interface of Photo Mechanic or the Adobe Creative Cloud products. There are some rough edges. Some options are a bit technical (which is sometimes a good thing and sometimes not) and you’ll find some unimplemented features or inconsistencies. When thoughts of that sort sneak up on you, pause and remember that you just got a powerful and complex tool for 30.83 US bucks. Or nada. Bupkis. Zilch. As the case may be. This How-To will only cover working with metadata in XnView. We come back to talk about using XnView (and our other software options) for optimizing photos for the web later. As far as the basic operation of the program is concerned, I leave you to the XnView website and YouTube. I’ll try here to help you navigate the confusing or nerdy patches. XnView has a dockable, tabbed info pane. I keep it on the left, but there are many interface options. Open a folder by single-clicking on it in the folder navigation tree. Metadata can be viewed in the Info Pane at left, or, optionally, in a tooltip in browser mode. The slide mount labels can also be configured to display metadata. a photo in the thumbnail browser, you will see a read-only view of metadata for that picture. The pane will show only fields that are populated. You can select various tabs in the pane. ‘IPTC-IIM’ will show you all of the populated IPTC fields you can edit in XnView. “XMP” shows you the populated XMP fields, including the ones that are in common with IIM fields. “Exiftool” shows a combined view of all the fields returned by ExifTool for that photo. There is a customizable tooltip that will show selected metadata when hovered over a thumbnail. I chose to show the Caption, Copyright, Filename, Create date, File Size, and Dimensions in my tooltip. More on customizing a tooltip later. If you customize it properly and elect to display it, the thumbnail browser’s slide mount label can present chosen metadata. I’ll talk about customizing that later, as well. Icons appear on the slidemounts in the browser to indicate what categories of metadata exist for that photo as well as rating, color marker, and tagging (persistent selection) icons. If you double-click on a thumbnail, a large preview will open in its own tab. The Properties Pane can be called from the context menu in Viewer mode. in the toolbar that will open a tabbed floating metadata window with the same information that’s available in the Info Pane of the thumbnail browser. The Properties window can also be called from the right-click context menu. “CMD/CTL+I” calls the Edit IPTC-IIM/XMP dialog. This is the metadata editor. 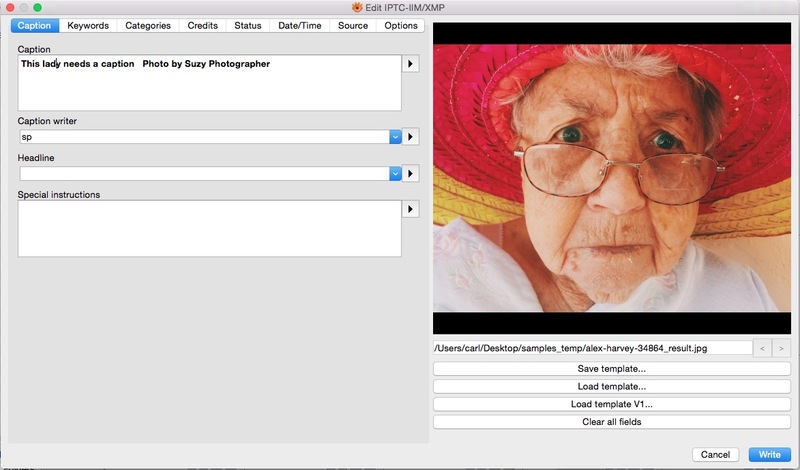 The IPTC-IIM/XMP editor is tabbed for different categories of fields and has a preview of the selected image. If more than one image is selected, there are navigation arrows allow you to move between them. Faithful readers know that I always tell people to never assume that a given user out the world will have the capability to see more than the most basic of IPTC fields. And often, they can only see the caption. You should plan your metadata with that in mind. Nevertheless, I really do like some of the extended fields. Rights Usage Terms, is a particular favorite. I miss it here. ‘Save Template’ and ‘Load Template’ buttons appear at the lower right of the dialog. They work pretty much as you would expect, with one twist. (You can safely ignore the ‘Load V1 template…’ button. It’s about backward compatibility with old versions.) Templates are discussed in more detail in this post. In XnView, you can overwrite a template by simply selecting it in the ‘Choose Template’ popup that appears when you click ‘Save Template’. That means you can use one or more templates as a clipboard of sorts. If you want to copy all IPTC metadata from a photo and paste it on one or more photos, it only takes two clicks to save the information to a reusable template. You can then paste the information by loading the reusable template and clicking ‘Write” on the target picture. It’s not as slick as IPTC Snapshot in Photo Mechanic or Metadata Sync in Lightroom, but it gets the job done. Drop-down lists under most fields allow you to choose recently-used values for each field. 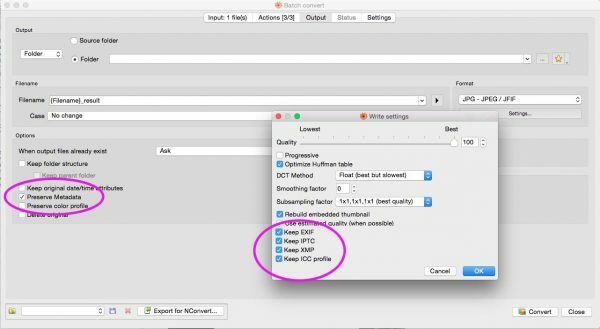 Open the IPTC-IIM/XMP editor and load a template. 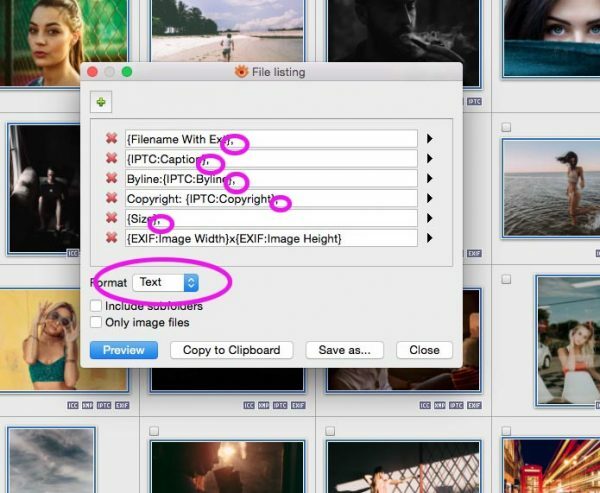 Captioning multiple photos in XnView. Note the information displayed on the slide mount labels. Add any caption and keyword data that is the same for all the pictures. Look on the options tab to be sure you’re OK with the overwrite options. “Keep and add new value” only affects Keywords and Supp Cats (The latter are deprecated. Ignore them unless your client says otherwise.) “Keep original value if new value is empty” is a usually a good idea. And, “Replace only if original value is empty” isn’t usually what I want, but it seems like it could be handy if, say, you don’t want to accidentally overwrite a copyright field. Finally, there’s an option for writing only to IIM, only to XMP, or synchronizing the two in your choice of directions. I keep mine set in the XMP-to-IIM direction. Barring rather odd circumstances, you want your IPTC data synchronized between the two formats. Which direction normally doesn’t matter. The options are sticky. You don’t have to look at this tab every time. But it never hurts. 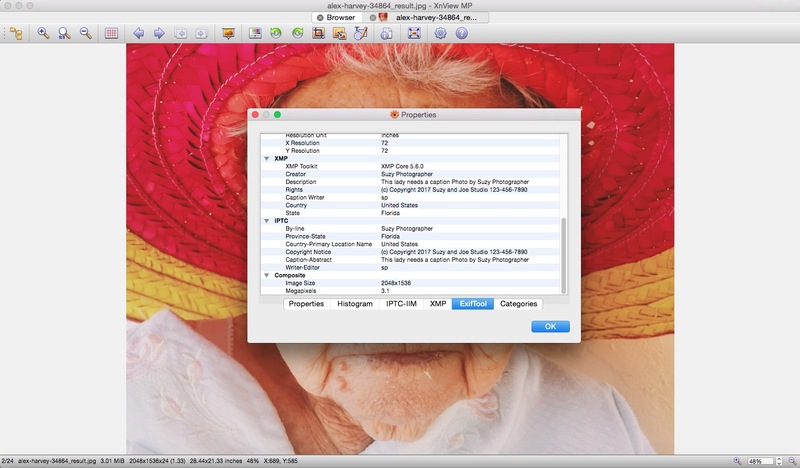 Check the options before applying metadata to multiple images. Next, you’ll go back and open the editor and add per-picture caption and keyword data. Note that when you edit a field, you’ll be overwriting the whole field with new data. So, say, in the Caption, you would simply insert your caption ahead of the already-existing information. You can’t prepend or append in the way you can in Photo Mechanic. There are at least three ways to save files in XnView, and each contains metadata options. Beware of the “Remove all metadata” tickbox in the Export dialog. ‘Export’ opens an interactive Save-as dialog. In it, in addition to very granular JPEG options, you have a tickbox that allows you to strip away all metadata as you save the photo. Obviously, barring strange circumstances, you need to make sure that’s not ticked. There are metadata options in the files saving preferences. These preserve metadata when ticked. Tick them all! these settings from the main menu at ‘File > Format Settings’. This time, there are individual tickboxes that preserve, rather than delete, various categories of metadata. Remember that your IPTC metadata lives in both IIM and XMP formats. So, you don’t want to delete either. Also remember that ‘File > Format Settings’ opens the global format preferences pane, just as if you navigated from ‘Preferences’. Whatever you set here is sticky. It will become the default. ‘CMD/CTL+OPTION/ALT+S’ will open the Export dialog from the large preview. (Oddly, Export isn’t available from the Tools menu in this view.) I’d use this method of saving with non-default settings, instead of changing my defaults with ‘File > Format Settings’. But that’s just me. In Batch Convert, the Output options tab has a metadata tick box, and there is another set when you click the settings button for your output file format! Then there’s the powerful Batch Convert command (Tools > Batch Convert). In Batch Convert, there are at least two options that affect metadata. On the Output tab, there’s a tickbox for ‘Preserve Metadata’. And, for each output file format, there’s a button for ‘Settings…’ There, you’ll find the keep-categories-of-metadata tickboxes in a dialog similar to the ‘Format Settings’ one. Frankly, I don’t know which of the tickboxes in Batch Converter takes precedence over the other. In Batch Convert, batch actions can write metadata into selected fields, or clear it by categories. is no append function. The flyouts by each field here insert into the field variables which will be replaced with the specified value on a per-picture basis. 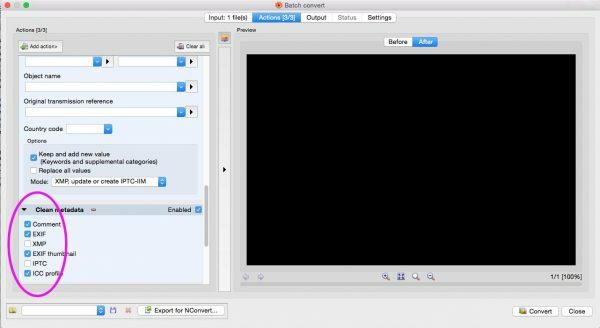 There will be more about Batch Convert in a future post, when we talk about using XnView to prepare images for the web. You can choose what the tooltip displays in the thumbnail browser in XnView, making the tooltip a very useful gadget. Go to ‘Preferences > Browser’ to find the tooltip’s settings. There’s an ‘Insert >>’ button at the bottom of the (huge) input field. Use it to insert variables. You can type in words that will always stay the same, like “Photo by: ”, if you’d like. Configuration for tooltips allows display of metadata. Note that you can use some HTML formatting, such as the line breaks and bolding shown in this example. There are two more pieces of big news here. You can insert some HTML tags, like “<br>” to add a line break and “<b> and </b>” to bold text. And, you can save and load your tooltip templates. So, you can have several for different occasions. That’s very cool. You don’t have a keystroke to turn tooltips on and off – that has to be done from Preferences – but that’s not such a big deal. The tooltip is quite compact and unobtrusive. I just leave it on. At ‘Preferences > Thumbnails > Labels’, you’ll find a tool for configuring the labels that appear on the slide mounts if you select ‘View > View As > Thumbnails + Labels’. You can insert any metadata field from the list on the left as a line in the label, and you can select up to six custom fields from the bottom of the list and populate them with variables. You can even set the color for each line in your label. I made mine with the copyright statement in red. This feature could be a time-and-lawsuit saver if, say, you were using XnView to check photos before you publish them on the web. Slide mount labels can be configured to display selected metadata. You can even specify colored text. Under ‘Tools > Metadata’, you’ll find ‘Clean…’ This opens XnView’s dialog for deleting metadata. The advice that appears in Photo Mechanic’s dialog for the same function does not appear, but perhaps it should: Do this on copies only, never on a photo that you are going to keep. In this dialog, you can select categories of metadata and remove them from a file. Interestingly, you can strip the Exif thumbnail or GPS data from the Exif while leaving the rest of it. But you can’t do it the other way around – strip all the Exif metadata, except the GPS. Remember once again that your IPTC data is in both the IPTC-IIM and XMP sections and you need both copies. The Clean Metadata dialog allows removal of metadata by category. It also contains an option to optimize your JPEGs’ Huffman table. In the Clean Metadata dialog, you’ll also find a curious tickbox – for ‘Optimize Huffman Table’. Optimizing the Huffman table is a lossless operation that makes JPEG files a little smaller. It saves you a few percent of file size without penalty. XnView offers this as an option in its file saving settings. But from here, you can re-do the Huffman table in an existing file without inflicting the damage of re-saving the image itself. That’s a handy feature. I would never have looked for it in this particular dialog. But now you know. Knowledge is power. There’s an edit GPS information dialog in this submenu. It does exactly what it says. Nothing fancy. There’s also an option for rebuilding the Exif thumbnail, for all those people who want unnecessary stuff in their files. This could be useful if, for some reason, you have a picture where the embedded thumbnail doesn’t match the photo itself. Assuming you actually want an embedded thumbnail. I guess. I liked results from the File Listing feature best when I added commas to separate fields, saved as a text fie and then changed the extension to .CSV to produce a spreadsheet. works for you. I found I got the best results if I placed commas after each item that I wanted, then saved the results as a text file. I then changed the file extension on the text file from “.txt” to”.csv” and opened the file as a spreadsheet. (See illustration). The equivalent feature in Photo Mechanic is a lot friendlier. The print dialog allows you to create metadata-annotated prints and contact sheets. Its operation is pretty obvious. You can, of course, print to PDF if you need to send someone a contact sheet, or for posting with photos on a file sharing platform, like Dropbox, that doesn’t display captions. So there you have it. It’s not Photo Mechanic. It isn’t as polished. It wasn’t designed to be used by people in extremely stressful situations, like war zones. But XnView gets the metadata job done. 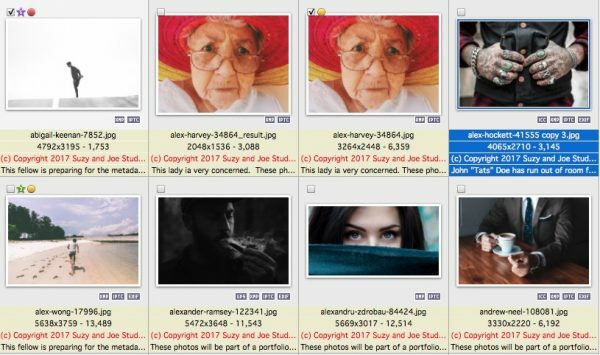 It does a few things that no other program can, and is on offer at a price that leaves no excuse for not paying proper attention to metadata, whether you’re a photographer or just someone who is responsible for a website. In future posts, we’ll be back with How-To’s on using XnView and Photo Mechanic in a website production workflow, and specifically look at how each approaches optimizing images for the best possible page load times. Please speak up in the comments. And check out our other software How-To’s, including on working with metadata in Photo Mechanic and Adobe Lightroom. Hi, i’m tring to replace Lightroom with XnviewMp, but i really don’t understand which field in Xnview i have to fill for the title. In LR there is a Title field, but in xnview? 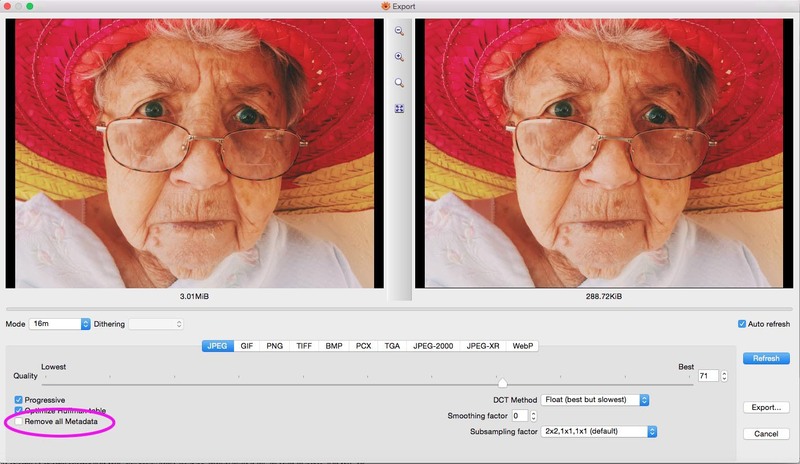 is there a way… or better… what is the best way to add a Title to a photo with xnviewmp? In the past i’ve used only Lightroom and in LR there is a “Title”..but i don’t find anything similar in xnview. 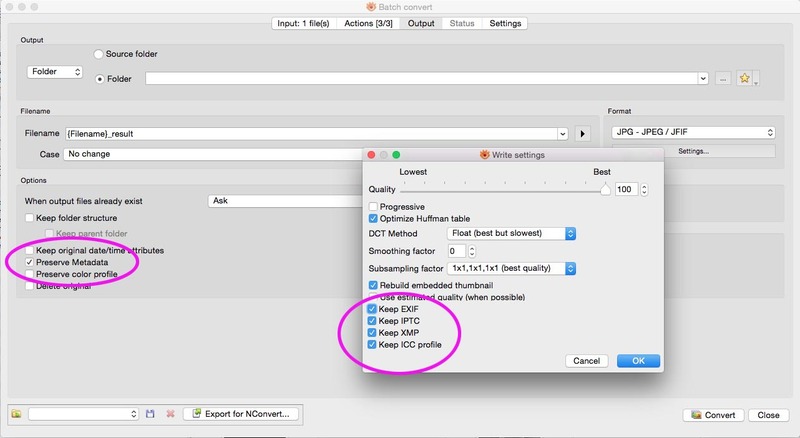 The Object Name field (Title – same field by a different name) is in the Source tab in XnView’s IPTC editor dialog. Different software puts fields in different sections in the interface (Photo Mechanic puts this field under Status, for example.) And different programs refer to given fields using different names, sometimes names that are officially recognized in the standard and sometimes not. This one can be “Object Name”, or “Title”. (or “Title/Object Name”, for that matter) Either is okey-dokey according to the standard. The caption is officially “Description/Caption”. I can’t even count all the different names applied to the Byline/Author/Creator/Photographer field. Thanks for the clear explanation ! Metadata is a very valuable crusade. But is there a simple way to batch export my EXISTING db categories to the files’ metadata ? I want to migrate a collection of pictures to Synology Photo Station, and still access there as keywords the DB categories I used to define in XnView. There are thousand of files, so editing manually IPTC for each picture is hardly an option. I couldn’t find any option for that in the batch export tool as now. I’m sorry I haven’t replied sooner. I somehow missed your comment in the queue. I just went through the XnView changelogs back to 2014 and I didn’t find any mention of Pierre adding the feature that you (and several others) want to do that. That feature has been requested for years now. Our comments function misbehaved for reader Bo De Lang, who has found a solution to Jeremy’s problem. I’ll paste in his findings here. I’m happy to report that I do have a way in which this can be achieved using XnViewMP. 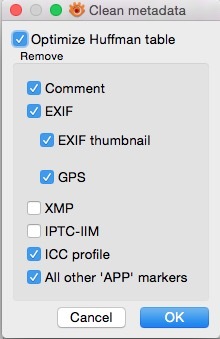 2) in Preferences|Browser|Metadata|IPTC&XMP under Keywords tick Export DB category to XMP Subject and IPTC Keyword. Tick either one or both of the subheadings. Tick Write hierarchical keywords if appropriate.